Kim West, LCSW-C, known to her clients as The Sleep Lady®, has developed an alternative and effective approach to helping children learn to gently put themselves to sleep without letting them “cry it out”—an option that is not comfortable for many parents. This book tells parents everything they need to know about sleep from newborns up through age five. It helps parents gently guide their young babies into good sleep rhythms from the start, laying the groundwork so that they can learn to “sleep through the night” when they are older. It gives tips on night weaning older babies, scheduling naps, and helping children discard the “sleep crutches” that make them wake during the night. For older children, the book helps parents know when to move from a crib to a bed, when to consolidate two naps into one, or how and when to give up naps altogether. It even has advice on how to deal with all those “curtain calls,” when older children want Mom or Dad to come back and tuck them in just one more time….one more time and one more time. Essential reading for any tired parent, or any expectant parent who wants to avoid the pitfalls of sleeplessness, The Sleep Lady®’s Good Night, Sleep Tight offers a practical, easy-to-follow remedy that will work for all families in need of nights of peaceful slumber! 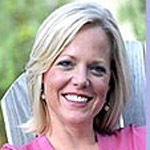 Kim West, known as The Sleep Lady® by her clients, has helped more than a thousand parents learn to listen to their intuition, recognize their child’s important sleep cues and behaviors, and gently create changes that promote and preserve healthy sleep habits. Kim, a mother of two and a Licensed Certified Social Worker-Clinical (LCSW-C), has been a practicing social worker for more than twelve years. She received her Master’s degree in Clinical Social Work from Simmons College in Boston, Massachusetts. Kim lives with her family in Maryland. Joanne Kenen is a journalist and mother of two who graduated from Harvard University, then went on to report from Latin America and the Caribbean, New York, and Miami before settling in Washington, D.C. where she writes on U.S. politics, health care, and health policy. Joanne lives with her husband and their sons outside of Washington, D.C.